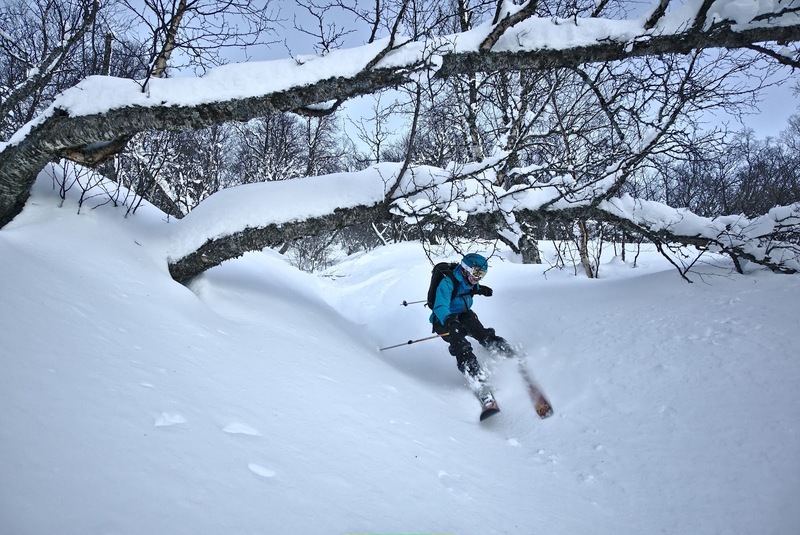 In temperamental Norway, white Christmas is never a given. As we packed for Christmas celebrations in Audun's hometown of Tingvoll, I tucked running shoes alongside ski gear, not knowing what this holiday season would bring. We decided to break up the severn hour drive north with a stop for cross-country skiing at Sjusjøen (of Birkebeiner fame) above Lillehammer. 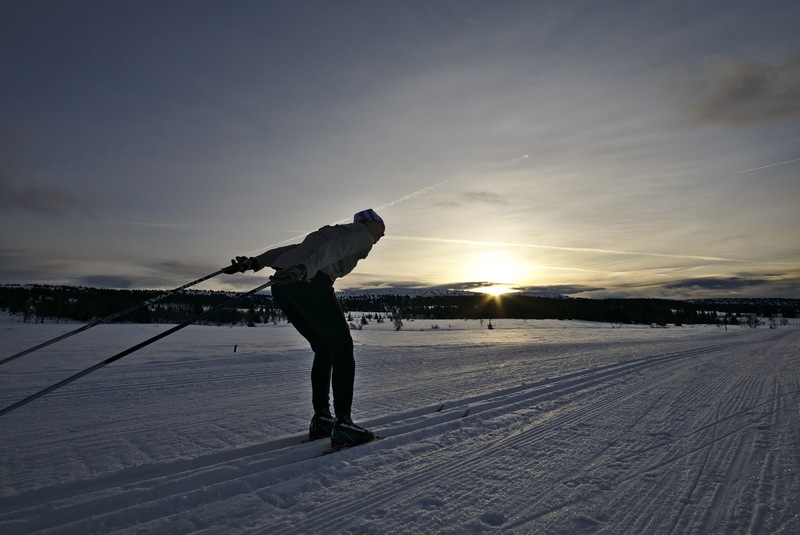 Although there was some light rain during our ski, wonderful, fast ski tracks and slanted December light made up for it. The winter storm Birk was battering the west coast of Norway, but luckily the only mountain pass we had to drive across, Dovre, was far enough inland to be spared. 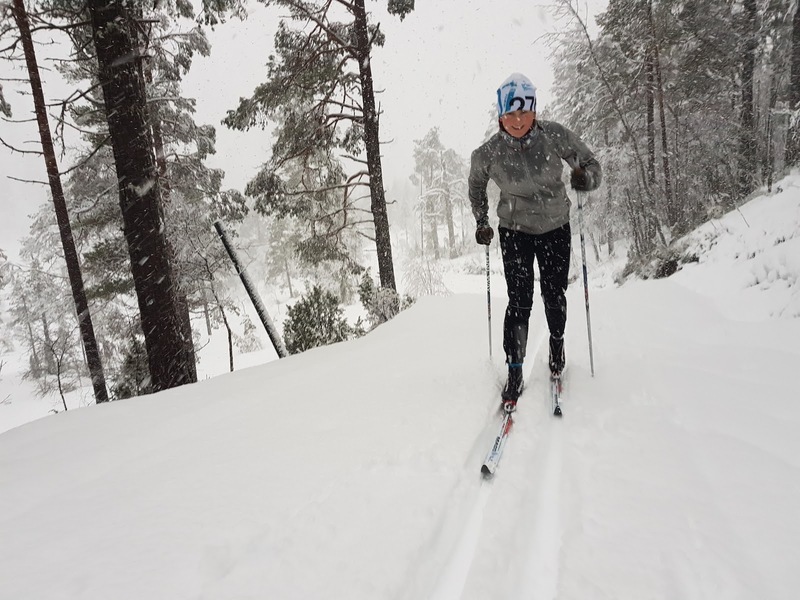 The result of the storm was snow, snow and more snow in Tingvoll, and on Christmas Eve we joyously headed out to the local ski trails. Unfortunately the groomer had decided to take the day off. 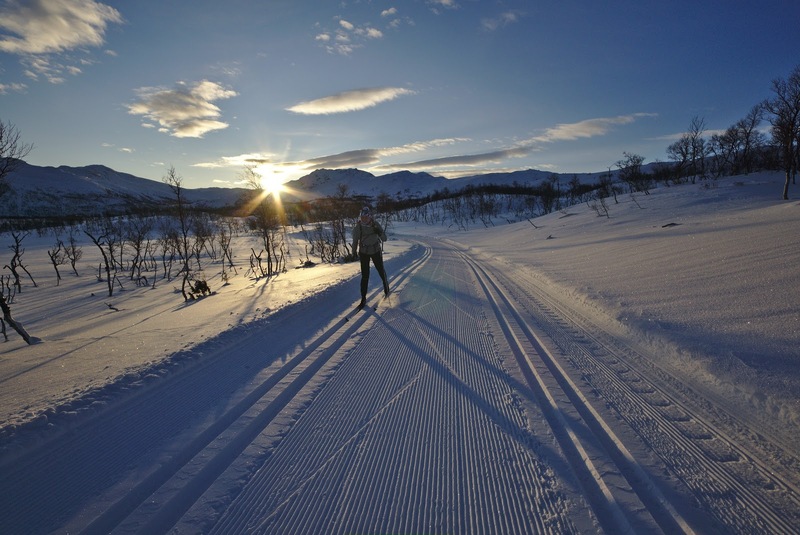 A heavy layer of sticky new snow combined with skinny cross-country skis did not make for fast skiing. Still, I was ecstatic to be moving through a magical, snowy world, no matter how slowly. They groomed on Christmas day, and the skiing was much faster. 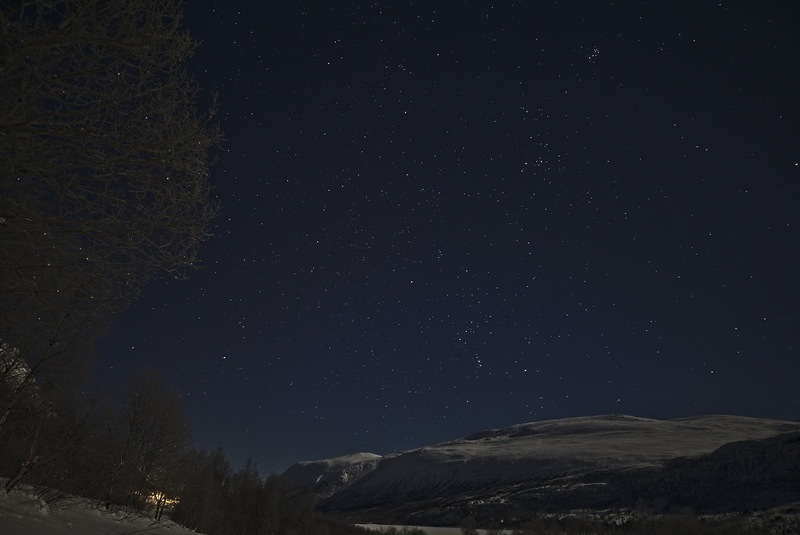 After a quiet Christmas celebration, we headed to Oppdal with Audun's parents. 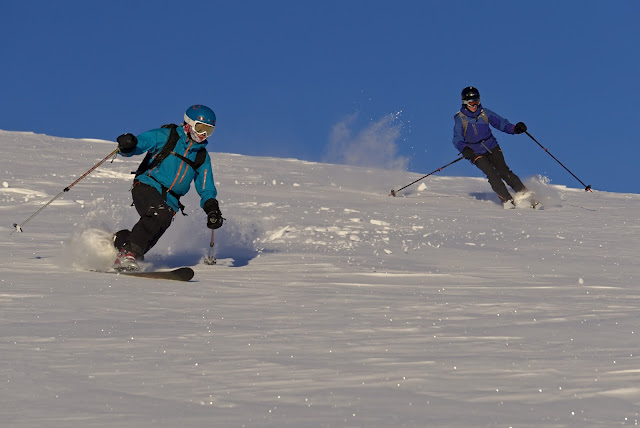 It had snowed a ton in Oppdal as well and we decided to break out the telemark skis and buy lift tickets. Somehow we managed to overlook the strong winds in the weather forecast! 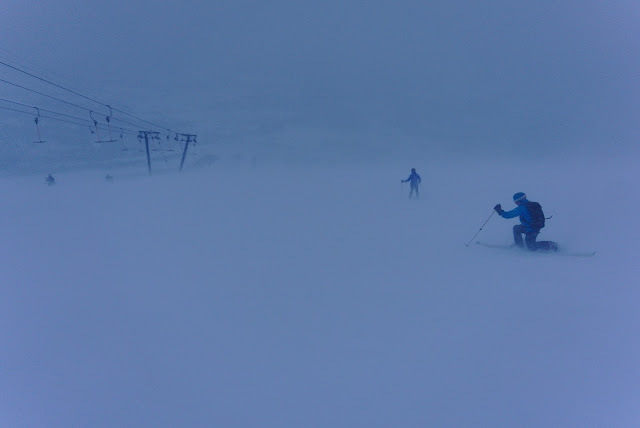 Above tree line, the visibility was low to none, and windblown icy snow crystals felt like daggers on to any unprotected skin. It was a day for staying below treeline, and we found a sweet powder stash out of the strong winds. After lunch, the wind had picked up even more, and they closed all of the lifts. So much for lift serve! We drove into Bårdsgården, the DNT hut where we were planning to spend the next couple days, and in my restlessness I put in a short run. Lesson: downhill skiing legs make terrible running legs. The wind had abated the next day, and there was sun on the forecast. 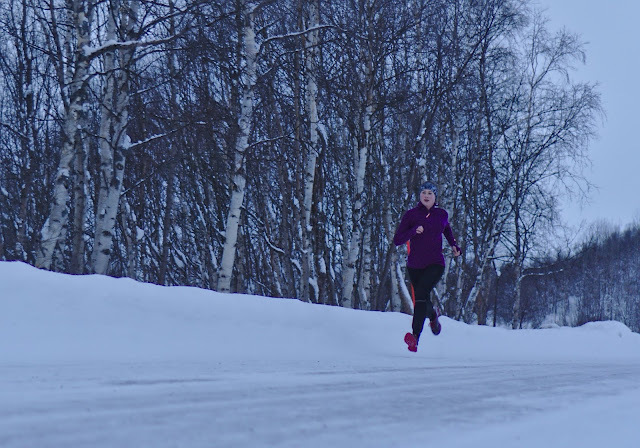 It was a frigid -18°C as Audun, my mother-in-law Marianne and I got ready to skin up towards Okla. Skinning uphill is hard work, and we warmed up quickly. Still, we were happy when we ascended into the rays of the late December sun, which warmed the soul if not the body. Unsurprisingly, the summit ridge was windswept and nearly devoid of snow. We turned before the summit (which is rather flat and uninspiring anyway). 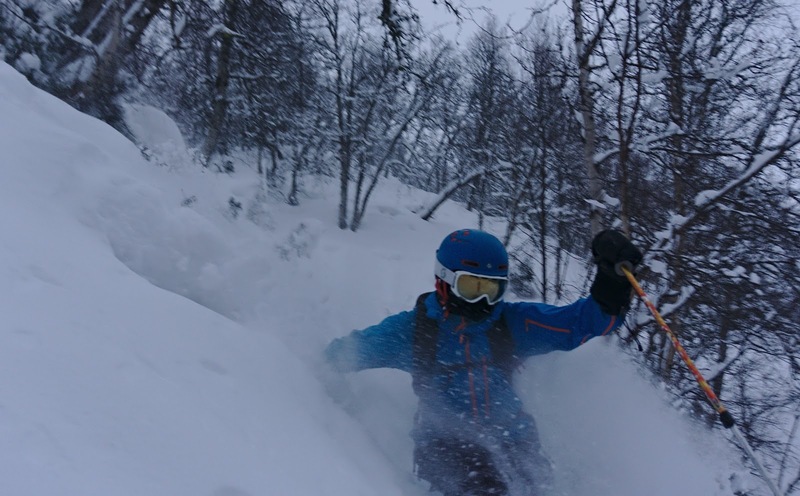 The conditions on the way down were variable, with hidden pockets of pow dabbed among larger section of tough windblown crust. Needless to say, there were a lot of hilarious falls! The snow in the trees had been protected from the wind. 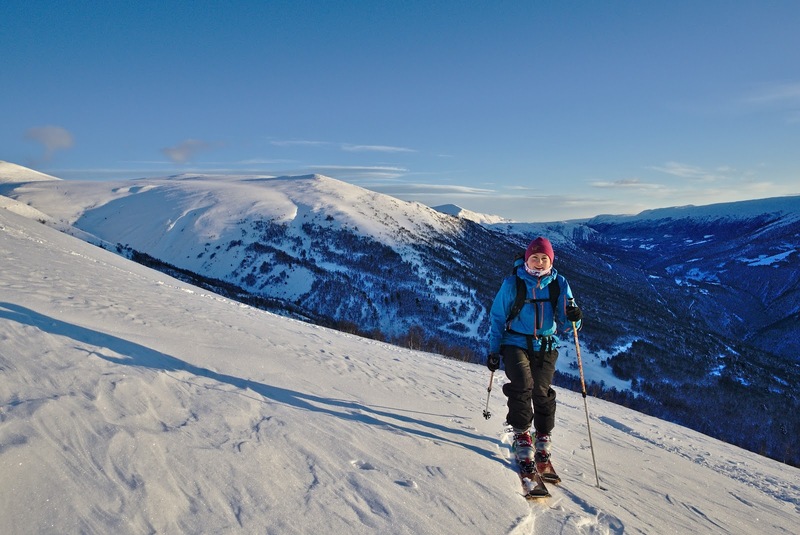 It was so much fun Audun and I decided to climb up the other side of the valley for a second lap. 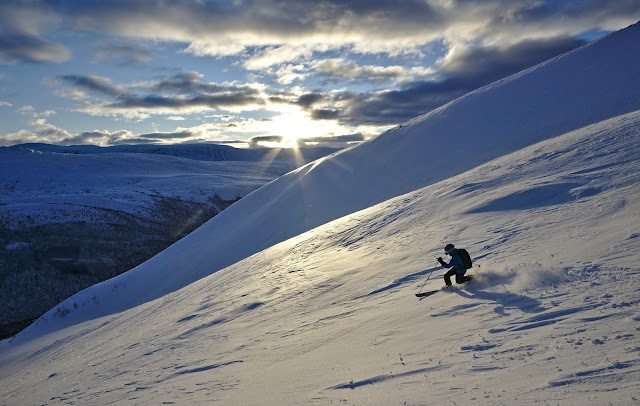 We were out of the sun this time, as it was now setting, but the skiing was magnificent. The cold, clear day turned into a cold, starry night, and we bundled up to go out stargazing. We walked down the road until we could no longer see the lights of the nearby farm. We were alone with the bright moon floodlighting the landscape, and endless twinkling stars appearing as our vision adjusted to the night. 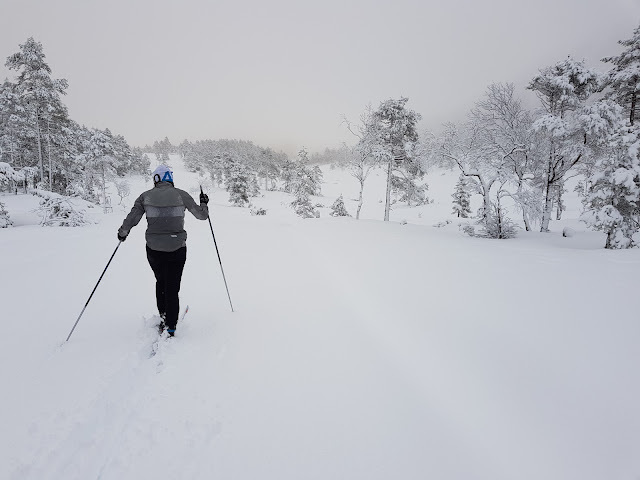 The next day we decided to check out the nearby cross-country ski tracks. I had developed a sore throat, a fact I choose to ignore so I could go outside and play! 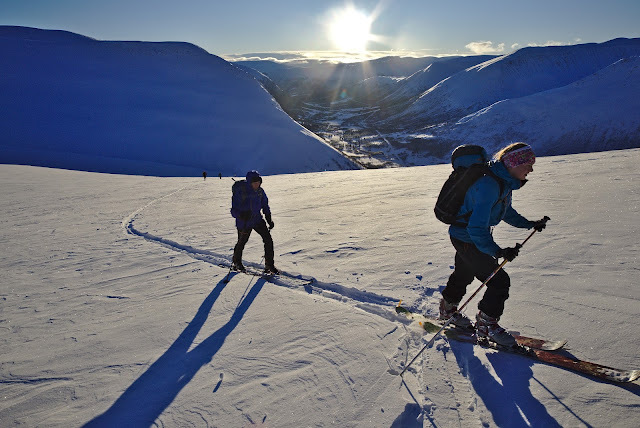 The tracks took us up towards beautiful Innerdalen, and provided panoramic mountain views that differ greatly from the heavily forested ski trails around Oslo. We were out relatively early, and had the freshly groomed tracks to ourselves until we turned near the end of Tovatn lake. We stopped for a brief snack before a long downhill to the valley, and I started to notice the penetrating cold. My hands grew numb as we sped downhill, and I stopped to put on mittens in a futile attempt to warm them up. 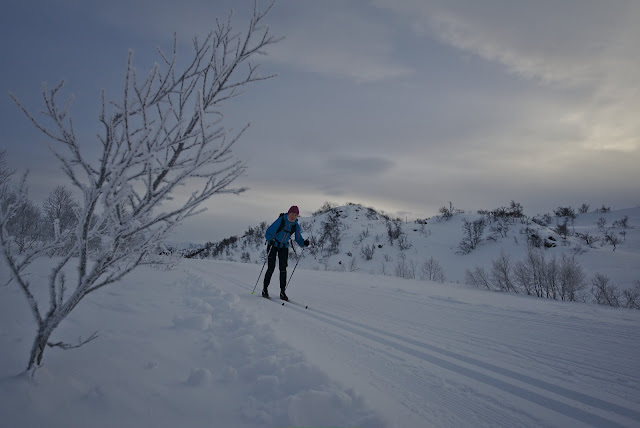 The final kilometers along Ångårdsvatnet lake were absolutely frigid, and the snow creak under our skis as we rushed to get back to the warmth of the hut. It's fun being out in the cold, but it's also fun to warm up afterwards! With more sun on the forecast, we decided to see if we could bag a new peak before heading to Skarvatnet for our traditional New Year's celebration with friends. It was another cold, clear day on Roksdalskammen, with the spectacular slanting sun casting blue shadows in the valley below. The snow above tree line was just as windblown as the previous days, but we decided to go to the summit anyway. This was a new one for me and I like collecting peaks. We managed to find some decent snow on the way down, although the best was in the trees as before. Unfortunately the tree skiing involved a lot of bush whacking, of the 'use your helmet to deflect branches' variety. We skied into our friend Andreas' cabin at Skarvatnet for the final days of 2017, and revelled in more beautiful cross-country. I don't think I've ever seen so much sun between Christmas and New Year's in Norway! A crowd of 20 gathered at Andreas' cabin on New Year's eve. 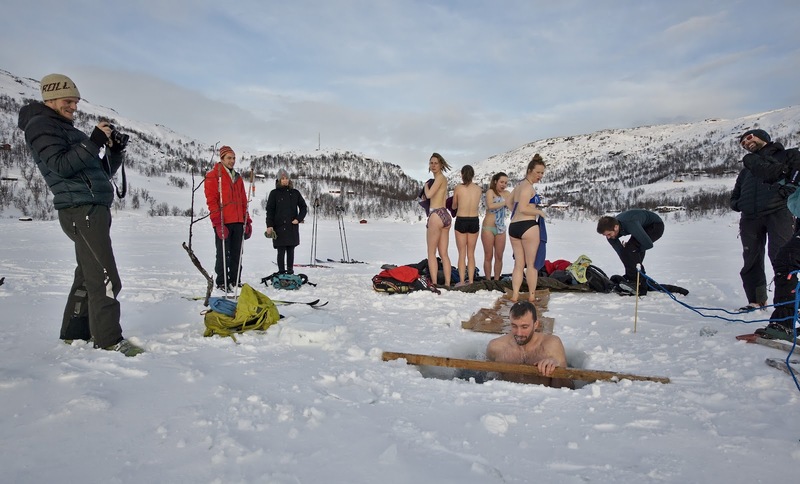 We celebrated with due pomp and circumstance, eating Norwegian 'pinnekjøtt' (steamed salted sheep's ribs), setting off fireworks at midnight, and of course, swimming in the frigid lake on New Year's day. Happy 2018! Here's to another year of adventure! This looks awesome! 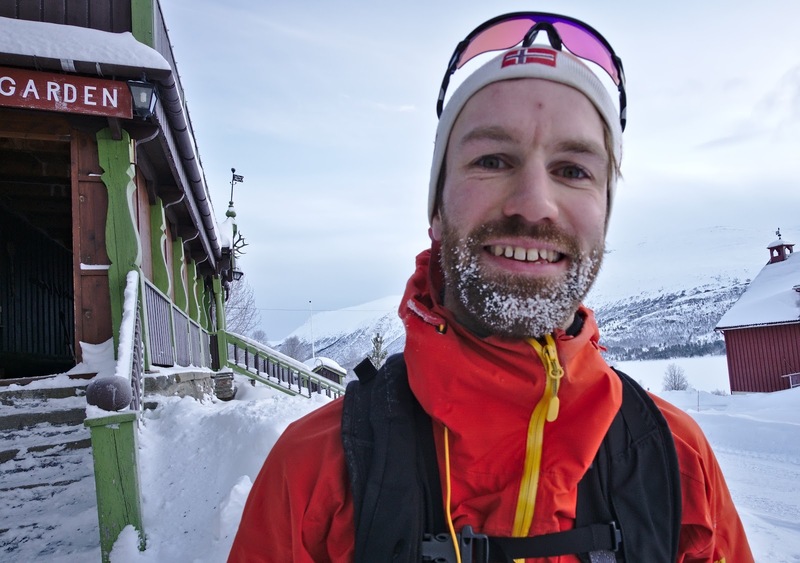 Looks like you got a little bit of every winter adventure and weather condition possible. That was an incredible post which you have written. I liked each and every word of – right from the starting to the end. The pictures have rekindled my fond memories. I had a similar party for my graduation in the best of LA event venues. With friends and family, it was pure fun.